Influencer marketing works, and for a lot of reasons. It outsmarts ad blocking for one. Most importantly, it’s proven to build consumer trust and confidence. As influential as word of mouth, influencer marketing banks on people’s desire to know what their friends, family, and trusted sources think about a product before making a purchase. With more and more brands and agencies looking to increasing their budget in influencer marketing, it’s just expected that competition will get fiercer. Most companies and agencies work their backs off to produce good content. But when everyone’s vying for attention, how can you make your content stick to make influencers notice it? Here are some valuable tips in terms of tailor fitting your content for influencer marketing. 1. You have to have a solid foundation to begin with, and that is quality content. It’s accessible. If you want to present a complex idea, break it down to more bite-sized chunks. It’s actionable. Most people have real problems, so if you can show how to approach those problems, there is more value. That’s why instructional and how-to posts are so popular. It’s visually appealing. Depending on the article or video, create useful screenshots or easily shareable images, whether on the blog itself, or other channels, and use share button. High-quality thumbnails on your YouTube videos, for example, grab more attention and make them highly clickable. Again, providing real value is your first step in making a connection. And that all boils down to knowing your audience and including just enough information in your posts to help them achieve something. Do you always have to publish original content? I’d say create something better than the original, look for unique and creative ways to make it better, then reach out to the right people. Creating visuals for data-driven blog posts, for example, make them more engaging. Think infographic, slides, or video that summarizes the main points. Brian Dean explains this Skyscraper Technique is effective since there is already a demand and a prime audience for content that already worked so well. Not to mention that existing content is already well indexed on Google and has a high ranking, so a definite plus for your SEO. Don’t forget to cite your sources for every data, quote, and indirect mention you include in your post. These reliable sources include researches, white papers, studies, and guess what, tips and advice from experts in your niche. And citing these influencers in your quality content only strengthens their value, and value they give to their audience. 2. What type of content can you make to promote to influencers? 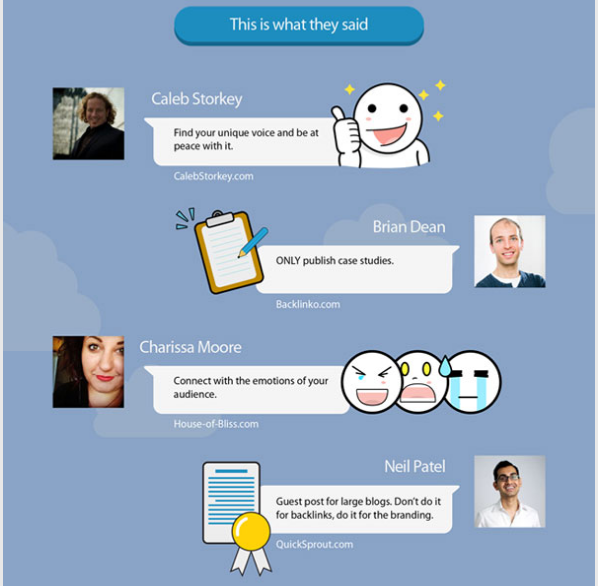 Ask your favorite influencers for a quote and use those in an infographic or create a SlideShare. Ask for experts’ tip and put them all in one blog post. The key is making your content relevant to what the influencers are advocating or promoting to make it more appealing. Sometimes just being friendly and personable, and referencing something recent they did, will work wonders. Adam Connell, Marketing Director at UK Linkology and the Founder of Blogging Wizard, said that the most success he has come from crowd sourced content, such as group interviews. In one blog post, Connell reached out to a number of industry influencers, asking for their best tip on expanding their online presence. The post hit an impressive 2,000-plus shares in social media. But what made it even better was when he teamed up with Niall from TweakYourBiz.com. They republished the post as an infographic, which has been seen by over 30,000 people and gotten 2,000 -plus more social shares. Connell’s advice? Don’t push influencers to share your content. Ensure that they’re only mentioned when relevant. More often than not, they will share your content, especially if it’s well constructed. 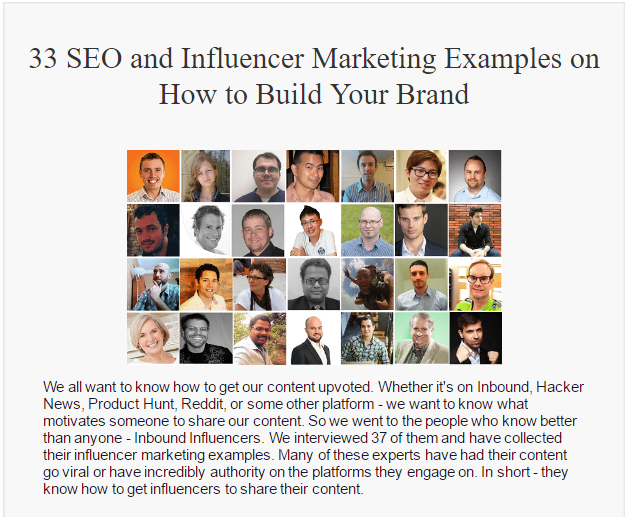 Email the influencers and let them know they’ve been featured in your article. If influencers do not respond to your message, send follow-ups and find other ways to engage them over time. However, if they are not interested in your content, some will politely decline and others will give you the silent treatment. There’s nothing much you can do at that point, and you need to rethink your strategy. 3. 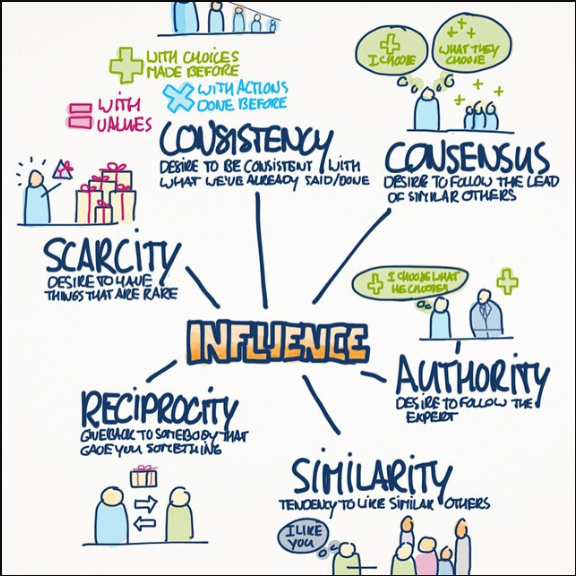 How do you find the right influencers? Building relationships is important, and so is looking for the right people who would want to share your content, regardless whether they get compensated for it or not. You need to ask, do I know this person? Would I trust this person to give product recommendations? Because consumers will ask the very same questions before deciding what action to take. Then narrow down your selection by identifying who’s going to be interested in your product, maybe someone who frequently blogs, reviews or endorses similar products, and/or is interested in getting paid through affiliate programs. Second, analyze the amount of engagement they are doing and getting in response. Although you need to look at the number of subscribers and followers, consider the quality of conversations they generate as well. Are there significant comments and replies about their product reviews and other posts? Do the influencers themselves reply to those comments, whether favorable or not? What’s their attitude toward negative comments? How many people are talking about the post or article? How many marked it as favorite? How many shares did it get and in what channels? Third, use an influencer marketing tool to find social media influencers, including their names, email addresses, websites, descriptions, SEO, and follower counts. Doing so will make managing your outreach campaigns easily across hundreds of websites and multiple projects. Influential marketing will not give you overnight success. It’s a gradual process of building relationships and nurturing them. Providing well-researched and valuable content alone takes a lot of time, as well as strengthening your connections and delivering consistent messaging. Do your homework. Connect. And be friendly and personable without sounding too desperate for attention.